The kids are screaming at each other. They’re becoming so demanding. I want to scream. I’ve read all the parenting advice I can take. Nothing works. Nothing! I just want to run away! No, you’re not fired…sorry. 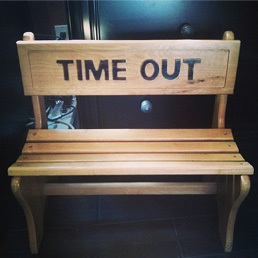 But it is definitely time to set the timer – “mom, you’re in time-out!” Remember the traditional calculation for time-out is one minute for every year of your age. This makes sense to me; the older we are, the more obligations we have, the less likely we are to take care of ourselves! So, for most of you, that would be 25 to 50 minutes of sustained time-out – as needed, but not less than daily. Time-out is a necessity for moms and caregiver-types who are giving, and giving more, to others without refueling themselves. How do you fill yourself up again after you’ve given so much away? Everyone needs something different. One mom can catch five minutes here-and-there and feel like it’s “enough”. Another mom might need an overdue vacation with her spouse while another might need a mini-vacation completely alone. One mom once told me she “shouldn’t” complain about her life. She had it all – two beautiful children, help when she wanted it, time to work-out every morning. In her words, “no matter what I do, nothing makes it better”. Watch out for those “should’s” and “shouldn’ts”. You must listen to your heart. Look deeply to discover what you truly need. Is it time to give up the illusion of being a perfect parent? Remember, perfect parents do not raise perfect children. They raise children who never feel good enough. Is it time to reevaluate your friendships? Parenting requires a support network of people who understand and share your values and goals. Are you doing too much for your children? Children of all ages need to feel the satisfaction of doing things for themselves and for others in age-appropriate ways. Have you learned to ask for help and accept the kind of help that others have to offer you? No one can parent 24-7 and remain sane. Where do you start? When things feel most out of control, you have to rebuild brick by brick. If you find yourself communicating with your children with short fuse and a quick temper, stop and take ten deep breaths. You aren’t accomplishing what you want. If “everything” is wrong, stop and take twenty breaths. You cannot fix anything when you are feeling overwhelmed. If you are working on changing behaviors with your child, only “fix” one problem at a time. For example, address temper tantrums separate from meal time issues and bath hysteria separate from social conflicts. Too many “no’s” undermine your success on any one issue. If your child is in an oppositional stage of testing and contrariness, keep rules simple and predictable. Most importantly, take time-outs regularly. Some stages are more demanding on parents. Children go through periods of disequilibrium when they are internalizing rapid changes. Parents need to fortify balance in their lives to have the stamina to support their children through these emotional growth spurts. Where will you take your time-out? In the closet reading a magazine? At mahjong or scrapbooking with good friends? Running in a park or walking on the beach? Start your list right now of all the things you miss doing and all the things you long to do. Then, for the well-being of your children, your family, and yourself, enjoy yourself. No guilt allowed!